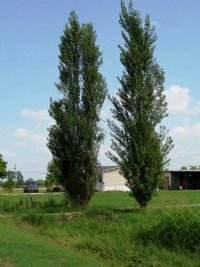 Lombardy poplars are fast-growing trees, growing as much as 6 feet per year. This makes them a popular choice when people want "living wall" privacy screens or windbreaks in a hurry. To serve this function,Lombardy poplars are planted in a row, and spaced about 8' apart.